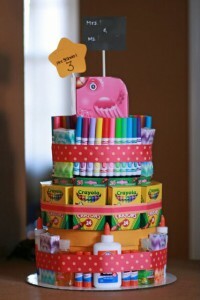 This School Supply Cake Tutorial uses a sturdy paper tube for the center base and ties the supplies on with cute themed ribbon. 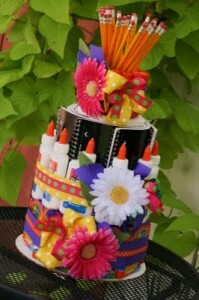 I like how this School Supply Cake Tutorial has a useful roll of paper towels for the center support. 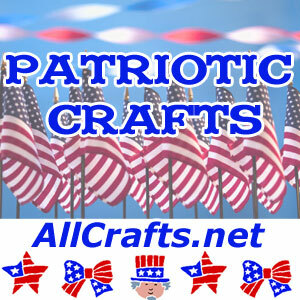 Love the cute flowers! 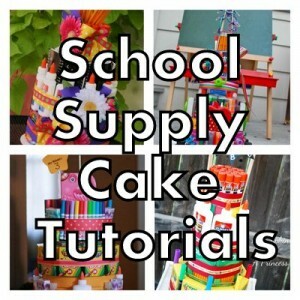 Stash extra treats or supplies that don’t fit in the nesting boxes used as a base for this School Supply Cake Tutorial. 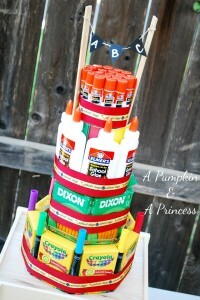 So smart to use a box of tissues for the topper. Wow! 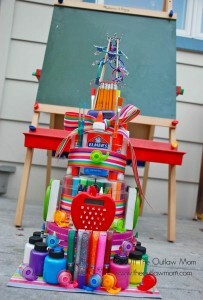 This School Supply Cake Tutorial goes all-out with a fantastic variety of school and art supplies. What a lucky teacher!